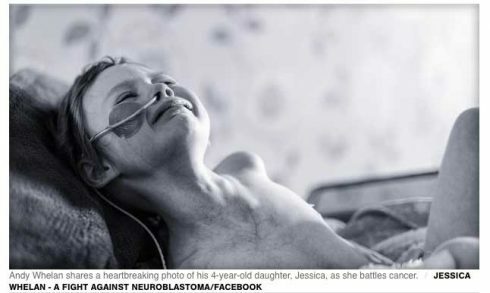 This is not a feel photo or story, and I suspect like me, seeing 4 year-old Jessica Whelan suffering from cancer and in pain in front of her dad is enough to bring tears to the eyes of any parent. For those sheltered from this kind of agony, a social network shared photo like this speaks far more than words. Heart-wrenching. I’m so grateful for my family’s health and pray for Katelyn and Drew‘s “Baby Oostra” growing in her mother (yes that is where my thoughts went immediately on seeing this photo). As a father who has only experiencing a fraction of this kind of helplessness with my daughter many years ago, I can only imagine what pain a father must endure in watching his daughter suffering the pain of cancer. May God be with Jessica and her family.